Dona's Hues produces a beautiful rainbow of opaque stains especially formulated for drybrushing and stain projects. They're also perfect for any craft project where an acrylic paint can be used. They're packaged in convenient squeeze bottles which means no more spills, stuck lids, or contaminated paint. Their antiques are of extra creamy consistency. Easy, smooth application means no more drips or spills. Clean-up is simple requiring only soap and water. Dona's Hues specialty products are formulated for a unique variety of special effects and combination projects. 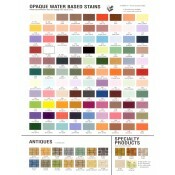 Dona's Hues Color Guide. One-page Flyer.